In Apple's latest round of removal of traditional features on computers, the company has eradicated conventional Function keys, and has replaced them with a Retina, multi-touch Touch Bar. At today's "hello again" event, Apple Senior Vice President of Worldwide Marketing Phil Schiller revealed the new Touch Bar as part of the renovations to Apple's new MacBook Pro line. As part of the reveal, Schiller lamented the older Function key array in a eulogy. Noting that they were introduced in the IBM 3270 mainframe terminal in 1971, Schiller noted that modern users don't really use them for anything, with most of them having been re-purposed for media control and other infrequently used commands. The Touch Bar is developer-customizable, and contextually displays menus and other features, including invocation of a conventional Function key lineup, if necessary. The removal of the Function keys has also enabled Apple to implement Touch ID, without another case penetration. 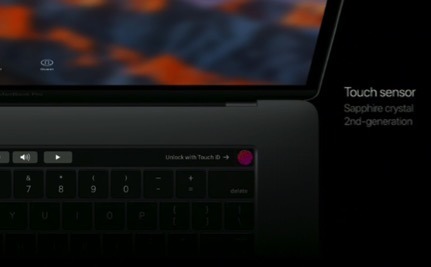 The sensor is embedded in the upper right of the Touch Bar with a Sapphire lens, and a secure enclave implementation with Apple's new T1 chipset. Users can also perform a fast user switch using Touch ID —all it needs to invoke is a registered user to touch the Touch Bar's sensor, and macOS identifies the user, and authenticates based on the pre-registered fingerprint alone. The Touch Bar can be customized in the Finder to implement control strip-based commands, and other user commands, such as screen capture, can be added to the bar as well. Other customizations in-app appear to be dependent on developers' implementation. Features similar to iOS's text prediction in Messages has been implemented in macOS on the Touch Bar, as well as emoji entry. 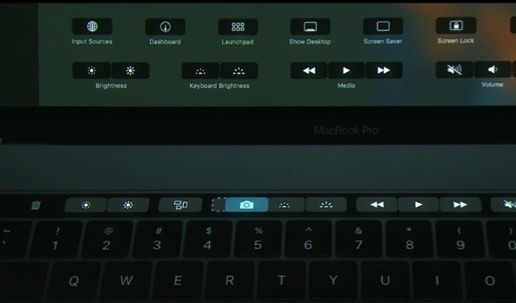 Other features demonstrated as implemented on the Touch Bar are application selection, scrubbing through media, and other playback controls.